Tina Winterlik: VANCOUVER EMPTY CONDO LOTTERY!! Blogger, Artist, Social Media, Web Designer, Photographer- I blog about nouns-people, places and things, even when it's negative I try to put a positive spin on it. Ha! Ha! Well I have the perfect solution for all those EMPTY CONDOS in Vancouver!! 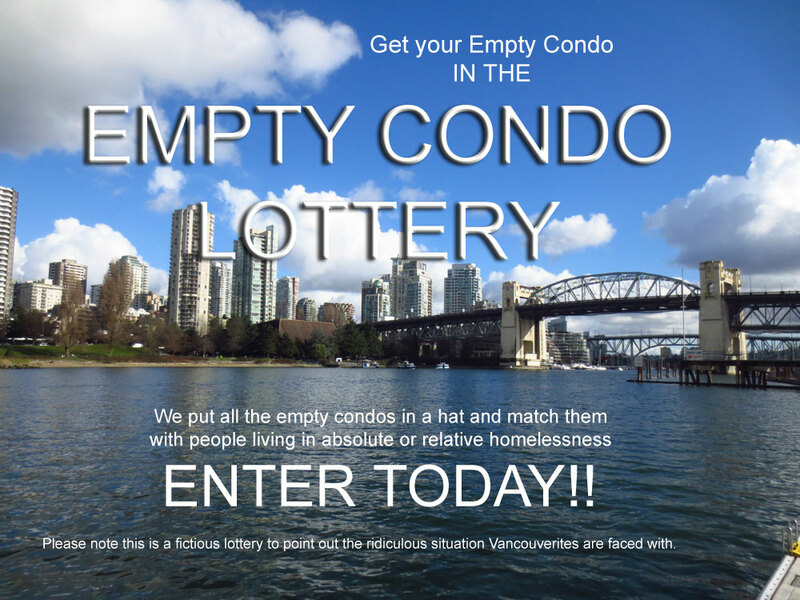 I suggest we confiscate ALL THE EMPTY CONDOS (because obviously these people don't need them) and put them in a lottery and we take all the people living in absolute and relative homelessness we put those in another hat and we HAVE AN EMPTY CONDO LOTTERY!! (I can't wait to get my condo!! ) hee!! hee!! Seriously though Homelessness is not a joking matter even if these condo owners obviously do!! That would put an END to this really FAST!! You get caught leaving your place empty- boom! confiscated and given to someone who needs and deserves a home. MAKES SENSE TO ME!! Homelessness in Vancouver, British Columbia, Canada is a social crisis that has been rapidly accelerating over the last decade. According to the United Nations, homelessness can either be relative or absolute. Absolute homelessness describes people living in absence of proper physical shelter. Relative homelessness describes people living in poor conditions of health or security, including an absence of both personal safety and steady income despite having physical shelter to reside in. As of 2011, roughly 2,651 people in Vancouver are subject to one of these types of homelessness, or are transitioning between them. Homelessness as a social issue in Vancouver originated from federal funding cuts to affordable housing. After market housing increased, the cost of housing became one of Vancouver's main causes of homelessness, alongside lack of income. The homeless population in Vancouver have developed or previously suffered from mental health and addiction issues, and they are subjected to high amounts of crime-related victimization. There have been several approaches to reducing the homeless population in Metro Vancouver by the city and other organizations. As of 2011, the rate of homelessness in Vancouver has stopped increasing, but it is not being reduced either. It's just as bad here then it is in Vancouver and I only live 45 mins. from Van. My bf and I are struggling too and if it wasn't for him we most likely would be homeless. Me finding a job here is a joke when I don't have nothing recent to put on my resume and all my references went belly up in business not to mention who wants a 44 year old when they can hire a kid who doesn't have rent to pay. Marie, I hear you loud and clear! Sending love and light! Let's keep pressing Justin for Basic Income and Affordable Housing. I am glad you liked the post. Sometimes the only way to get people's attention on serious matters is by joking or singing. Maybe now someone will write a funny, sad, ironic song and wake everyone up. Take good care. Big HUG! BERNIE WINS ALASKA, HAWAII & WASHINGTON!!! Good Friday Vancouver Aquarium Visit! Help the Oil Sands Workers Go Green! Bernie on Foreign Policy- Wise Words! VANCOUVER'S HOUSING CRISIS IS REAL!!!!!! The West is YET to come!! GO BERNIE!! Bernie & The People Will NOT ACCEPT OLIGARCHY!! Vancouver City- We NEED to GROW our OWN FOOD!! WAY TO GO CHICAGO!! PROUD OF YOU! Union Gospel Mission Steps Up! THANK YOU!! HURRAY!!!!!!! TIME FOR A GARDEN PARTY!! UNITE FOR INTERNATIONAL WOMEN'S DAY!! Bernie is the Most TRUSTED!!! LET'S TRY AGAIN! 2014-2020 Let's Go!! Do you WANT to be TREATED like THIS? Heard this new song? What's The Matter With Us? You may find spelling and grammar mistakes in my blog. I do try to go back and correct them when I notice them and have time . The reason is my brain works faster than I can type. As you can see I am SUPER VISUAL which is why I like to share photos, drawing, paintings, videos, film, but typing can be labourious sometimes and I don't care for it because people sometimes misinterpret my tone. Tone is very hard to convey in type sometimes, fonts themselves can mess with everything. So this is why you will find spelling mistakes. Also as I say to my friends, love me or leave me. If you like my blog stay and visit, if not move along and I wish you a lovely day. I just wanted to add a little bit that things change with time. There may posts on here from 7 years ago and I have grown, and learned so much since then, that I may think differently. So when you read my posts also consider the age of it.